A quick comment on the 3325B service manual – Thanks to a kind contributor. 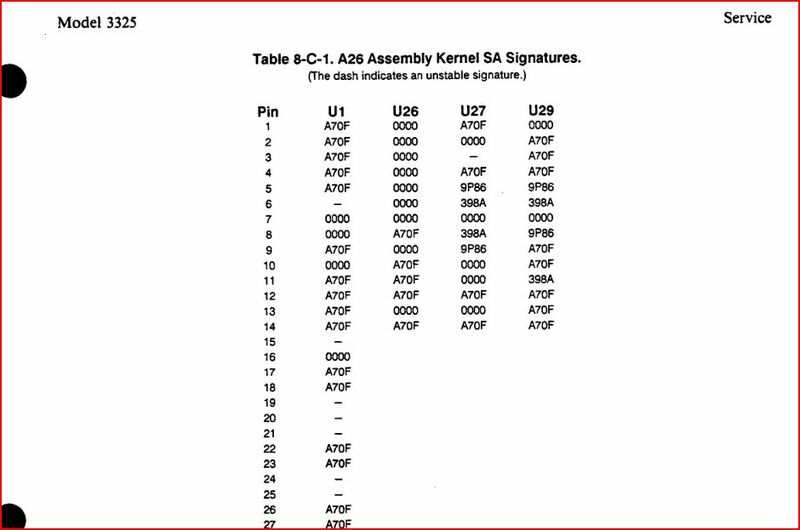 The kernel SA test is a bit flaky on A26U27 PIN 10. 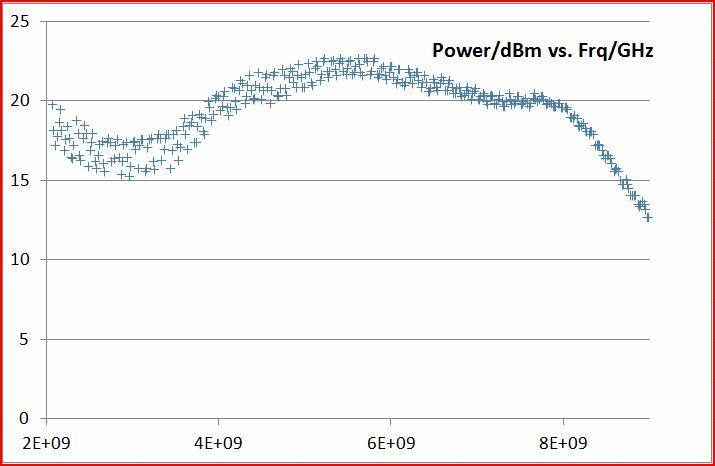 This is an inverter output, and can’t be same as the input… correct signature is A70F. Appears to be a misprint in the HP service manual! In the present case – the culprit was one of the SRAMs, the lower byte. Fortunately, not really a rare part, and easily sourced and replaced, once you know that this is the circuit at fault. 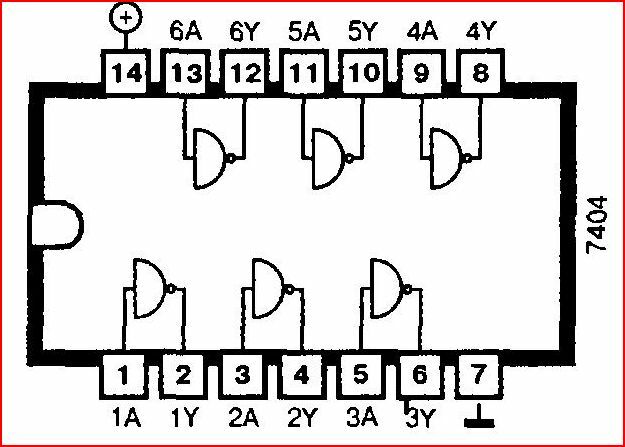 You might want to check this very carefully, because there are multiple versions of the 3325A/3325B control boards. 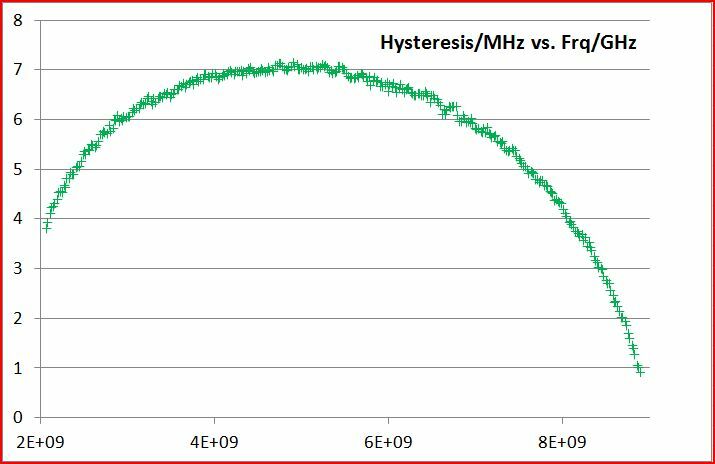 With a good number of YIG oscillators (YTOs) around, time for a few tests. 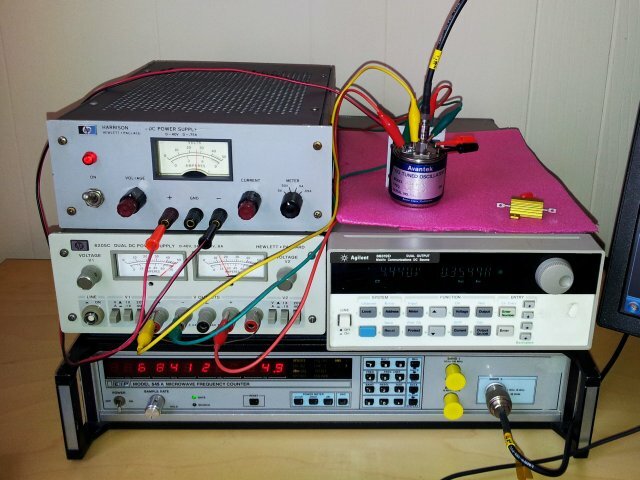 Rather than writing down all the numbers, a quick test setup, with two power supplies, an EIP 545A counter (with built-in power meter), an Agilent 66319D power supply (used as current source for the main tune and FM coils of the YTO), a 14.5 dB attenuator (just happens to be the value I had around) and a few cables. 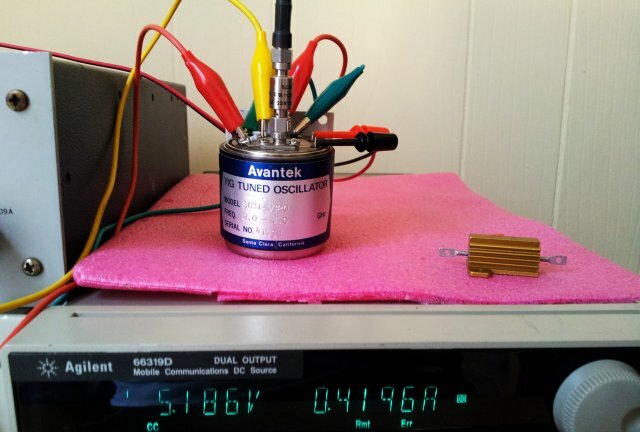 When performing such test, make sure to put a 10 dB (or larger) attenuator of really good quality (low SWR) directly at the YTO output, without any adaptors or cables in between – some YTOs will show inaccuracies of not properly terminated in 50 Ohms. One of the YTOs under test, a S081-0320 2 to 8 GHz Avantek part. 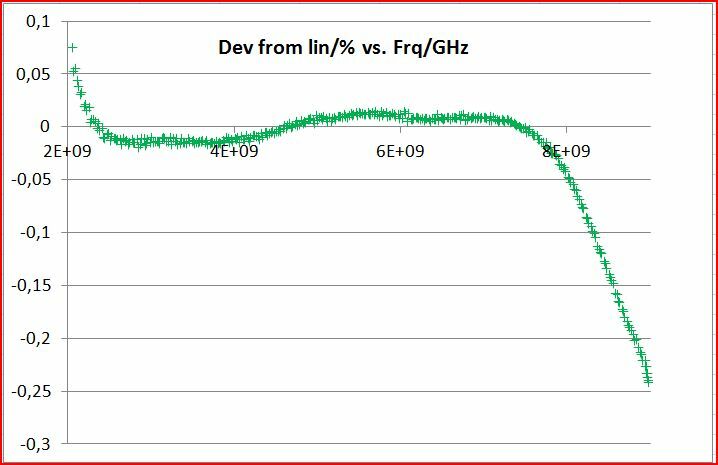 As you can see, the output frequency is pretty linear vs. main coil current. 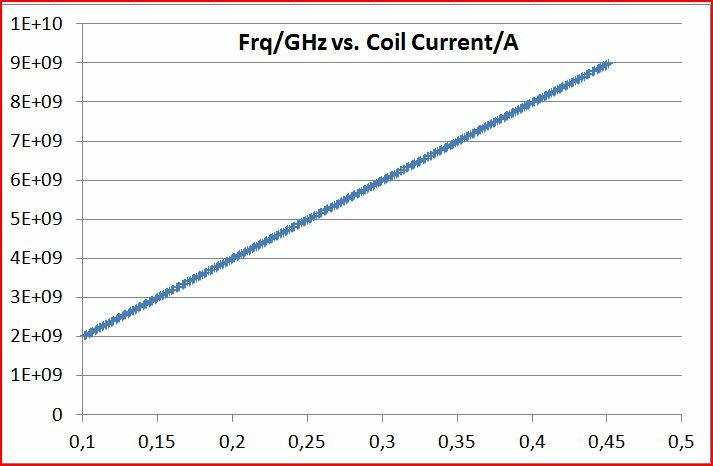 The tests are carried out first with increasing coil current, then with decreasing coil current, and the hysteresis is calculated (difference of output frequency, when a approaching from higher vs. lower current). One thing to watch out for are thermal effects, but let the YIG warm-up for 1 hour or so, with the main coil at half-range current. 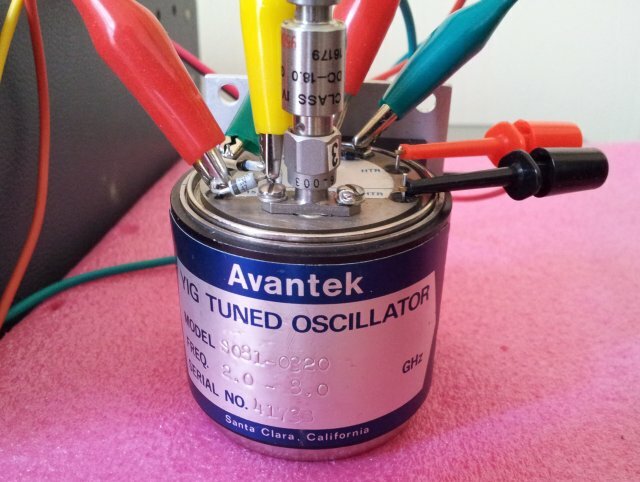 The effects aren’t all that big for the Avantek YTO discussed here, but you never now, for lower quality parts, other manufacturers, and so on.